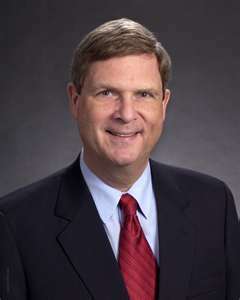 U.S. Ag Secretary Tom Vilsack says he cannot comment on the Des Moines Water Works lawsuit alleging boards of supervisors in three northwest Iowa counties failure to manage ag drainage districts has contaminated central Iowa’s drinking water supply. “But it is appropriate for me to talk about conservation and the role of USDA in all of this and I think what might surprise…many Iowans is how much conservation is actually taking place today in Iowa,” Vilsack says. Since January of 2011, the U.S.D.A. has awarded over $2.2 billion to Iowa farmers to help finance conservation projects to reduce nitrogen and phosphorus run-off into rivers and streams. “The reality is that this is a very complicated situation,” Vilsack says. “It’s going to take time, but I am absolutely convinced that people are committed to better soil health and better water quality.” Vilsack suggests the federal government is doing its part to stimulate conservation measures on Iowa farmland, but the state government could and should be “more aggressive” in its support of water quality initiatives. Vilsack suggests something similar to the “Vision Iowa” program he imitated 15 years ago when he was governor . Vilsack points to the Republican governor of Michigan, who has committed $45 million in state money for a single water conservation project. Vilsack made his comments during taping of the “Iowa Press” program that airs tonight on Iowa Public Television.